Today I would like to welcome prolific paranormal romance author Felicity Heaton at Ex Libris, who will not only tell you about her latest release, the 4th book in the Her Angel series (Her Guardian Angel ) but she also has brought you a very special guest: none other than an angel of death, Apollyon! So please give a warm welcome to Felicity and Apollyon and read on to learn more about Apollyon and his story in Her Dark Angel (and there is also a great giveaway waiting for you at the end). 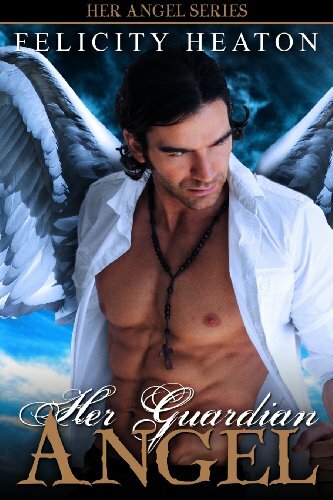 Thank you Stella for having me here again as part of my Paranormal Pandemonium 2011 Blog Tour, and in particular the Her Angel series section of it that celebrates the entire angel romance series and the release of the fourth book, Her Guardian Angel . I’ve spoken about Her Guardian Angel , introduced the series, and caught up with the hero and heroine from that book on my tour, and now it’s time to go back to the start of the series and the first book, Her Dark Angel , to introduce the hero and everyone’s favourite angel, Apollyon. I’ve managed to sit him down for an interview and prodded him into speaking about his story and his heroine, Serenity. 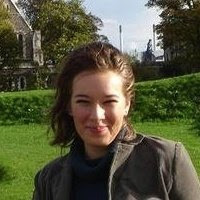 First, a little about myself. I write various paranormal romances as Felicity Heaton and my Vampires Realm series as F E Heaton. My paranormal romances are usually focused on vampires and werewolves , but I do also write demons and witches , and of course there’s my series about angels too. I’ve been writing original fiction since 2005, and have been an indie author since 2006, and in that time I have written and released over forty stories. If you’re new to the Her Angel series and haven’t read any of the books, then you won’t know who Apollyon is so I’ll try to describe him for you. Apollyon is one of the darkest angels in the series and the oldest. He was one of the original angels and spent time as the angel of death, and he’s also the Great Destroyer, an angel who will rain Hell down on Earth during the Apocalypse. On top of that he’s the king of the bottomless pit and often fights the Devil to keep him imprisoned there. Apollyon is talk, dark and as deadly handsome as they come, with long black hair he often wears in a neat ponytail and sapphire blue eyes. He has stunning black wings and since he’s of the division of angels of death he has beautiful black armour edged with gold, and his is decorated with gold lions to distinguish him from your average angel of death. He’s phenomenally powerful and is more than happy to wreak havoc on his enemies, but his black heart has been tamed by a petite French witch called Serenity. He is also a particularly impatient man when it comes to interviews, so I’m going to get on with it. FH: I have Apollyon here with me today to talk about his book, Her Dark Angel . Firstly, can you tell us a little about yourself? APOLLYON: Indeed I can. I was last reborn several thousand years ago into my usual role. I am one of the few angels who carries what is known as an eternal duty. That is a duty, or series of duties, that was given to me upon my creation. Because of my eternal duty, I am always reborn as an angel belonging to the division of death... and because of my eternal duty it is almost impossible for me to leave Heaven. Although I no longer report to them or work for them, I am still under the influence of my duty, and should need arise or events occur that trigger that duty, I will have to do the bidding of Heaven and fulfil it as only I can. Originally, I was the only angel of death, but mortals became intent on war and fighting, and so there is now a fleet of angels who carry out that responsibility. One of my main duties was to guard the Devil in the bottomless pit, and to fight him to keep him contained there. If I lose, the Devil will be free to roam Hell and then Earth. FH: You mentioned the bottomless pit. When your story, Her Dark Angel, starts, you’re in Hell guarding the Devil, and you had been down there for some time. What was that like? APOLLYON: Horrible. I had begun to tire of my time down there and my master had not spoken to me in many long centuries. I was alone with only the pool of history there. It is a pool in which the events in the mortal realm are recorded. There are pools in Heaven that have a similar function, but the one in Hell is unique. I would watch the world from the pool and it was the only contact I had with others. I grew tired of my duty there, alone and forgotten, left to suffer the oppressive heat and stench of Hell and endure the voice of the Devil. When I first saw Serenity in the pool, it was like seeing sunlight for the first time, or breathing fresh air again. I did not even realise I was manipulating the pool so I could see her. I thought it was chance that it would keep focusing on her. FH: How did you meet Serenity and how did you feel about them initially? APOLLYON: I heard someone calling me. It is difficult to explain what it feels like, but it is a sense that someone is speaking directly to my heart and compelling me. It was hard at first to discern the location of the call. I thought it was my master as only his voice was strong enough to call me from Hell. I took my chance to leave and made my way up to the mortal realm. When I reached the location of the call and discovered it was not my master but Serenity who had called me, I was surprised to say the least. A mortal should not have the ability to call an angel. I was curious and wanted to meet her and discover how she had called me. She saw straight through my glamour, the spell all angels cast to hide our wings and armour from mortal eyes and make us appear human. I knew then that she was different but I had not anticipated that she was a witch. Unfortunately, she knew of my reputation and fled. When I finally convinced her that I was not going to kill her and that I did not appreciate being called the angel of death since it was no longer my role, she confessed what she had been doing when I heard her call to me... and I realised that it was not her voice that had called me but rather that her heart had called to mine. I had felt her pain over the betrayal she had suffered at the hands of her ex-lover. Without caring about the consequences, I offered to serve her and give her the vengeance she needed in order to heal her heart. I wanted to crush him for what he had done to her. FH: Serious words from a very serious man. It must have been strange at first being around a witch considering that she can see through your glamour and see your black wings and armour. Did that cause problems between you? APOLLYON: I believe it did at first. Serenity knew all about angels and had no problem accepting what I was in the sense of believing I was real, but she had difficulty accepting my growing feelings for her. As did I. The moment I met her, I felt as though she had cast a spell on me. I could think of only her. When we first touched and then danced, I knew I had to have her. My little French witch had entranced me. I would have done anything for her and anything to have her, and I was intent on proving that it was possible for me to love her and that we could be together. APOLLYON: I wish I could say that is has changed in the way I had hoped it would but while Serenity’s voice is strong and I am under contract with her, I still have to continue to carry out any of my duties that are intrinsically linked to me and my creation. I do live in the mortal realm now, with Serenity in Paris, and we frequently have visitors in the form of my fellow warriors and their women. I have grown to hate it when anyone calls on me to go to Hell. That place is a prison to me and I know that Serenity fears for me whenever I have to go down there. The Devil doesn’t have a voice strong enough to sway me but I understand her fear. FH: Your story, Her Dark Angel , is a book in a series about several angels from different divisions. All of them are angels you’re familiar with and many would see you as their leader. Is that how you see yourself? APOLLYON: (laughs) No. Not at all. I am the oldest and possibly the strongest, but I would never see myself as their leader. We are all on an equal footing. At least, that is what I believe. We all have different strengths too. While my power might be stronger than that which others bear, they have strength where I do not. Einar is an incredible hunter, able to track the wiliest of prey, and has the ability to heal injuries. Lukas has an amazing strength of heart and is often the one to keep a level head in a crisis and convince those of us bent on violence to look at things clearly before taking the leap, and he is an incredible warrior. Marcus is one of the strongest angels I know and his skill with his spear is unparalleled. He is also a keen strategist and uses intelligence in his battles. Of course, we all have our weaknesses, and they all seem to be the same. We have all lost our hearts to our women. No matter how level-headed we try to be, the moment our women are in danger, all hell breaks loose. FH: The Great Destroyer finally admits that he can be a touch destructive? I suppose it comes with the territory and after witnessing you in Her Guardian Angel, I can agree with that word choice. Thank you for meeting with me today and chatting. Is there anything else that you’d like to add? APOLLYON: Only my gratitude to those reading this interview with me and my hope that this has given them better insight into myself and my fellow angels. I believe that since my story is the first in your series, that you have put a special price on it as an introduction to the series in light of your recent release of the novel Her Guardian Angel. I am not sure whether to be flattered by this or dismayed. (waves his hand dismissively) Never mind. I am sure you only desired for more mortals to read my story and fall in love with our world. FH: Maybe I wanted them to fall in love with you. (he looks uncomfortable) You’re very popular in my series, you know? Anyway, you’re right and it’s only a limited time offer on your book, Her Dark Angel , and I hope that readers will check it out. I’ll let you get back to Paris and Serenity now. Her Dark Angel, book one in the series, is currently on offer as my summer deal! You can get this angel romance novella for just $0.99 from my site, Amazon Kindle Stores , and Smashwords until August 28th. That’s a saving of $2.00! Find out more at my site! I hope you’ve enjoyed this interview with Apollyon and that it has intrigued you enough that you want to find out more about the series and the books, and that you’ll follow me on my Paranormal Pandemonium 2011 Blog Tour so you can learn more about the characters, the series and the books, and participate in the giveaways. You can find out my tour dates at my website. Her Guardian Angel is currently available in e-book direct from my website, Amazon Kindle Stores , Apple iBookstore and Smashwords. It will soon be available from Barnes & Noble, Sony, Kobo, and also as a paperback from Amazon sites. Other stories in the Her Angel series are: Her Dark Angel, Her Fallen Angel and Her Warrior Angel. Details of them and where they are available in e-book and paperback can be found at my website. Felicity offered to give away an ebook copy of Her Guardian Angel plus signed book cover postcards, bookmarks, keyring, coaster and magnet to a lucky commentator. Giveaway is open worldwide and ends on 31 August 2011!